You Define. We Design and Deliver. Engineered Pumping Systems / Packages are referred to by many names. They can be referred to as skid-mounted units, power units, pumping systems, base units, stacked units, pre-packaged systems, aggregates, horizontal pump unit, manufactured system, modular units, pre-assembled pump systems, fabricated systems or multiple pump systems. Regardless of the name you use, Cat Pumps can custom engineer your industrial pumping system to meet your specific application and installation requirements. With experience in hundreds of different applications, our Custom Systems can be configured to meet any application demands. 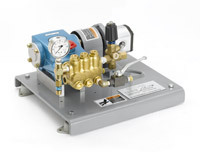 Each system includes all the required safety and pressure regulation valves to assure optimum performance and safety. 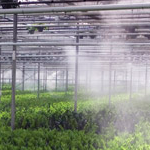 We fully test each pumping system and include an owners manual with start-up and maintenance information. 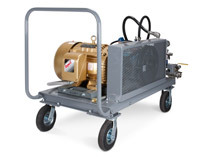 Our custom pumping systems are the quickest way to get up and running with the proper equipment. Please review the information below and let us know how we can assist you with custom system for your next installation.